Since 1997, the number of plastic surgery procedures for men has spiked 325 percent. Why are more guys seeking a nip and tuck? Former plastic surgery patient Barry Matthews told CBS New York those who are in upper management positions want to stay youthful looking, stay fit, and remain competitive. In other words, men – just like women—want to look as young as they feel, which can have a positive impact in their social and professional lives. The American Society of Plastic Surgeons, the world’s largest organization of more than 7,000 board-certified surgeons, has been tracking the types and rates of cosmetic procedures for decades. According to recent numbers, a whopping 1.3 million guys had some form of plastic surgery last year. What is fueling the male plastic surgery trend? There are many contributing factors to this trend. Dr. Jeffrey Janis (ASPS President) says that growing numbers of men want an ‘executive edge’ in the workplace. Others are embracing their vanity and looking for more effective ways to battle the middle-aged bulge. The majority of male patients who have gone under the knife (or the needle, as it were) are in terrific shape, hit the gym regularly and eat a balanced diet, but are struggling to get rid of stubborn areas of body fat or smooth out their facial wrinkles. The trend is also fueled by a willingness among men to talk about cosmetic enhancements – a relatively new development. Guys are no longer worried about being judged by their peers, as the stigma surrounding body contouring or facial injectables has waned. Those who are happy with their Botox injections or Kybella treatment are telling their friends and driving the increasing demand for both surgical and minimally-invasive procedures. “Over the past 5 years, I’ve seen a noticeable increase in male patients looking to improve their appearance,” says New York City plastic surgeon, Dr. Thomas W. Loeb. Forty five is the median age for today’s male plastic surgery patient, but Millennials are also jumping on the bandwagon, availing themselves of “lunch-hour” treatments to maintain a fresh, youthful look. 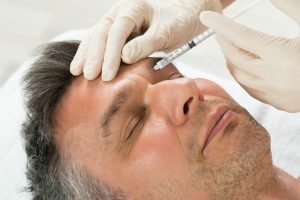 Botox – This FDA-approved injectable temporarily halts muscle movement that causes facial wrinkles. The most common applications are for horizontal forehead wrinkles, worry lines between the brow and crow’s feet. Rhinoplasty – also called nose reshaping, this surgery can remove humps, bumps, refine the nasal tip or correct breathing problems caused by trauma or a deviated septum. Liposuction – body sculpting with tumescent or laser-assisted liposuction removes diet and exercise-resistant fat cells from the stomach area, back, chest and flanks. Male breast tissue reduction – Nearly 30,000 men get gynecomastia surgery every year in the U.S. This surgery removes excess breast tissue for a more masculine shape. If you’re considering cosmetic enhancement and would like to discuss your options with one of the nation’s best, you can contact Dr. Loeb’s Manhattan plastic surgery office at 212-327-3700 for a one-on-one consultation.